This installation is applicable to Beech and Piper Main entry cabin doors on the series models listed above. It is also now applicable to Beech small baggage doors (20” wide) and the oversize baggage doors (38.5” wide) on the Beech series models listed above. 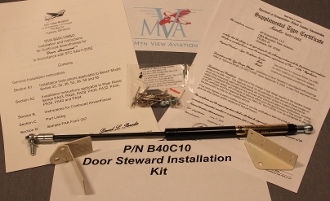 The Door Steward™ is a product improvement installation that greatly improves the operation of the aircraft door. The installation consists of a gas spring attached to brackets mounted on the door and the airframe door sill. When the door is unlatched the gas spring gently but firmly opens the door to the full open position. The gas spring while in the open position protects the aircraft and occupants from unexpected openings and closings by providing resistance to wind gusts and prop wash. Closing the door is a simple one handed operation to grasp the door arm rest and pull to the closed position. In addition, the gas spring is extremely simple and reliable. The weight of the installation is ½ Lb. Closing the door compresses the gas spring. The gas spring can easily be removed from its brackets to facilitate removal of the aircraft door, replacement of a defective gas spring or to conduct other maintenance.